Peregrine Honig is an artist and social entrepreneur based out of Kansas City, MO. Honig is the youngest living artist to have work acquired by the Whitney Museum of Art’s permanent collection and recently returned from The Robert Rauchenburg Foundation’s first annual SEED Summit. Honig is strongly dedicated to advocating and pedestaling the creative identity of Kansas City. She has been a business and creative leader in historic neighborhoods since 1997, co-founding The West Eighteenth Fashion Show, freelance curating, and developing innovative retail spaces in The Film Row and Bauer Machine Works Buildings, both constructed in the 1920s. A: Old buildings are beautiful ancient mistresses. They are fussy and high maintenance, but completely worth indulging just to learn their stories. Theodore “Ted” Seligson has committed his career to advancing architectural practice, education, and preservation. After earning his degree from Washington University, Seligson joined Kivett & Myers Architects in Kansas City. During his tenure, he became head of design and was responsible for some of the firm’s signature modern designs. In 1962, Seligson established his own practice in which he worked for more than 40 years, receiving more than 25 local and national honors. He has also been instrumental in the preservation movement, both in Kansas City and nationwide. Ted worked with Congressman Richard Boling to save and restore the west front of the United States Capital building. He was also instrumental in establishing the Landmarks Commission of Kansas City. Ted was elected to the American Institute of Architects’ College of Fellows in 1979. In 2011, he was awarded the Presidential Award by AIA Kansas City, and the Lifetime Achievement Award by the Historic Kansas City Foundation. Kaitlyn Bunch owns a home in Old Hyde Park with her husband Eric. She works at the Nelson Atkins Museum of Art and has a passion for biking. In fact, one of the primary reasons for choosing a home in the urban core was that they bike and walk for most of their daily activities, including work, groceries, errands and child care. Kaitlyn feels that preservation keeps our neighborhoods vibrant, safe, and places that people want to be. Q: Why do you consider yourself a preservationist? A: I consider myself a preservationist because I care for my home not as a possession but as a part of my city, my neighborhood and the history of each. I’m a preservationist just by recognizing the importance of one little shirtwaist and doing what I can to make it beautiful and keep it around for the future. Matthew Hufft is the President and Creative Director of Hufft Projects. The firm recently completed the renovation of the Grocer’s Warehouse, a 60,000 sq. ft. warehouse that sits at the base of Roanoke Park near the intersection of Karnes Boulevard and Roanoke Road. Hufft’s multi-disciplinary design studio is the flagship tenant of the space. The Grocer’s Warehouse was built in 1949 by Kansas City grocer Fred Wolferman. Hufft has also completed several rehabilitations along Armour Boulevard, including the Bellerive Hotel. In both his personal and professional practice Matthew believes in the importance of authenticity and keeping the fabric of the city intact. Q: What is your favorite building in Kansas City? A: My favorite building in Kansas City is the Nelson, because it is an exemplary example of how the historic and the modern coexist. Katheryn Shields is a former and current City Council member and former Jackson County Executive. Katheryn personally worked to preserve the Truman Courthouse on the Square in Independence and the Jackson County Courthouse in downtown Kansas City. When she took office as Jackson County Executive in 1995, the downtown courthouse building was in distress with leaking windows and ongoing deterioration of many architectural features. Katheryn saw that the major preservation effort was completed with success. Also, while serving on the City Council she negotiated $800,000 for historic preservation within the downtown loop and provided funding for a developer/preservationist planning effort. 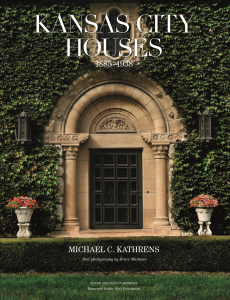 She has owned 3 historic homes in Kansas City, Missouri; a 1928 Tudor on Rockhill Road, a 1927 Tudor in Sunset Hills, and a 1980 Condo designed by Moshe Safdie. Devan Case is a founding principal of Pendulum Studio, a Kansas City, MO based architectural practice that specializes in the design and documentation of civic structures, multi-family housing, and sports facilities. He grew up in Queens, NY, Kingston, Jamaica, and Wentzville, MO. Devan is graduate of the Kansas City Chamber of Commerce Centurions Leadership program and an active member of the local and state chapters of the American Institute of Architects. He has led design efforts on over thirty civic and community projects in the past twenty years including Freight House Bridge, City Union Mission, Columbus Park Housing and The Guild, and is recipient of a 2013 NOMA Design Citation. Q: Why is it important for people to become more involved in preserving their community? A: There is inherent value in the health of a city when preservation of buildings is prioritized. Dilapidated and demolished buildings create “missing teeth” which [has] a negative impact both socially and economically. Jonathan Cole is a founding principal of Pendulum Studio, a Kansas City, MO based architectural practice that specializes in the design and documentation of civic structures, multi-family housing, and sports facilities. He is from Pomona California and has interests in music, fashion, and automotive restoration. Cole has led design efforts on over fifteen minor league ballparks across the nation in the past twenty years. Jonathan has as strong respect for history as it relates to the built environment and feels it is important to preserve the evidence of past innovations. Q: When did you first develop an interest in preservation? A: I jokingly say that I’ve been 60 years old for the past 42 years of my life. As far back as I can remember I’ve had an appreciation for the past – I think it’s an inherited trait from my parents who have a very deep appreciation for diversity and culture.